The days are growing shorter, the nights are becoming chillier, and there is a growing appetite for gingerbread and mulled wine – in other words, Christmas is just around the corner. Frankfurt Airport has caught the spirit, is turning on the lights and hanging up the tinsel just in time for the Christmas season. Some 300 shops, restaurants and services will be pulling out the stops to ensure a unique experience for visitors during the run-up to Noël. 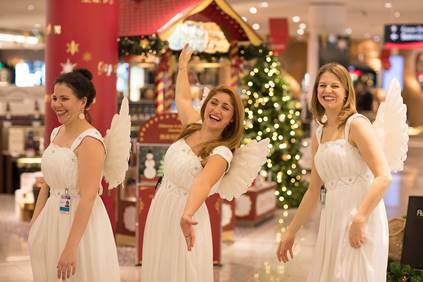 Singing angels will be creating a festive mood in international departures. On the four Advent weekends in December, a calligrapher will be decorating Christmas tree ornaments in Terminal 1, Concourse B. There will also be winter fun and games: passengers can partake in digital snowball fights, or try their luck with the wheel of fortune – and perhaps win discounts for airport shops. Money-off coupons will also be distributed in shops in the international departure lounge and are additionally available online. Plus, there will be seasonal culinary specialties to be enjoyed in cafés and restaurants. Shops and restaurants at Frankfurt Airport will be open throughout the holiday season: on Christmas Eve and New Year’s Eve until 6 p.m., on Christmas Day and on New Year’s Day from 9 a.m. Normal opening hours apply on Boxing Day (December 26). It is not just the terminals that have recognized the fast-approaching reindeer.Frankfurt Airport Online Shop has embraced its digital Santa Claus with a variety of special offers and gift ideas – including traditional items, such as fragrances and jewelry, but also headphones, famous brands of liquor, and gastronomic treats. Passengers can reserve products online for later collection. Travelers resident in Germany can also arrange for the order to be delivered to their home as long as their destination is in an EU country. Last-minute shoppers still looking for the perfect present on December 23 are well advised to make their way to the airport. Whereas stores in the city of Frankfurt will be closed on Sunday, the airport will be providing last-minute Christmas shopping, with seasonal offers and promotions amidst a festive atmosphere. Approximately half the shops are located in the pre-security areas of the terminals, and are therefore accessible to the general public. In line with its declared vision: “Gute Reise! We make it happen,” the airport operator Fraport has placed the focus firmly on passengers and their personal needs. With this philosophy in mind, Fraport continues to develop new services and initiatives designed to improve the airport experience and enhance customer centricity at Germany’s most important aviation hub.